Advertiser.ie - Viva la Diva! 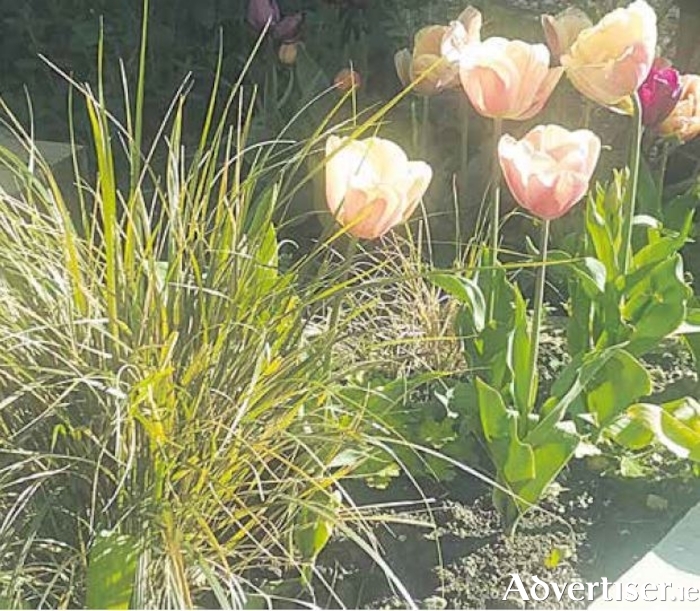 The spiky foliage of an evergreen grass complements the tulips in this border. As I write the tulips are making a wonderful show in the garden and every time I look out the window they lift the spirits. They have to be one of my favourite flowers, both for growing and cutting and I could never have too many. Which is just as well, as in our climate they are the least reliable of spring bulbs – hence the diva reputation. For every dozen you plant, eleven or twelve will perform beautifully the following spring, but in the year after that you would be lucky if two or three bother to show up. This is because tulips are natives of the middle east and the bulbs are accustomed, in their native habitat, to a good baking each summer from the sun once the foliage has died down, which they rarely get in Western Europe. You might be inclined to associate them with Holland, which indeed produces vast numbers of the bulbs we plant in our gardens, but actually their natural home is further south and much, much hotter. All of which makes them rather an indulgence to the domestic gardener as the most beautiful and desirable varieties are naturally the most expensive, and can’t be relied on to flower annually like most other spring bulbs. But what a way to indulge! What other flower give such a spectacular show as spring edges towards summer – although the display might only last three to four weeks, to my mind, they are worth every cent. You’ll see them in displayed in serried ranks in municipal flowerbeds and on roundabouts at this time of year, but in a garden, I think a natural approach is better. I like to scatter them amongst perennials and grasses in a more natural way – I think this displays them to best advantage and they look particularly elegant emerging from the fresh new perennial foliage. They’re a brilliantly colourful way to bridge the gap from the end of the early spring bulbs and the first of the summer flowers. It’s lovely as well to plant them en masse in terracotta pots or glazed containers, which complement them really well. This allows you to move them out of sight when they’ve gone over, and also allows you to enjoy them if garden space is tight. Divas they may be, but they’re worth it!